Alejandra Deheza of School of Seven BellsSometimes less really is more. Yeah, it’s a cliché but, as School of Seven Bells demonstrated with their new album and their recent show at the Black Cat, sometimes a band needs to lose a member to find its soul. School of Seven Bells originally formed as a trio consisting of Benjamin Curtis (who also produced the band’s albums) and sisters Claudia and Alejandra Deheza. On their first two albums (Alpinism and Disconnect from Desire), SVIIB played experimented with a variety of different styles, fusing elements of dream pop, shoegaze, rock, and dance beats into a unique, if somewhat inconsistent sound. However, while many of their songs were individually compelling, these early LPs lacked the cohesive structure necessary to make the leap from a collection of good songs to a truly great album. Benjamin Curtis caught mid rock star poseThat all changed with 2012’s Ghostory. Prior to recording the album, Claudia Deheza departed SVIIB, leaving only Benjamin and Alejandra to carry on the group’s work. The natural move might have been to pare down the sound, reduce the complexity of the songs, and focus in on tighter melodies. Of course SVIIB did just the opposite, building their biggest, boldest, most ambitious record to date. On Ghostory, SVIIB adds layers that were only hinted at on their prior albums, ratcheting up the My Bloody Valentine inspired wall of sound, and using the best tracks as a powerful showcase for Alejandra’s haunting vocals. They also made the astute decision to build the album around a timeless story of love and loss (from the perspective of a girl named Lafaye) that adds to the emotional impact of the tracks, and elevates Ghostory above their prior work. On April 5, SVIIB brought Ghostory to life at the Black Cat. With the assistance of two additional players, Benjamin and Alejandra wove their spell on the historic stage, filling the space with the dark, dreamy ambience that suffuses that album. 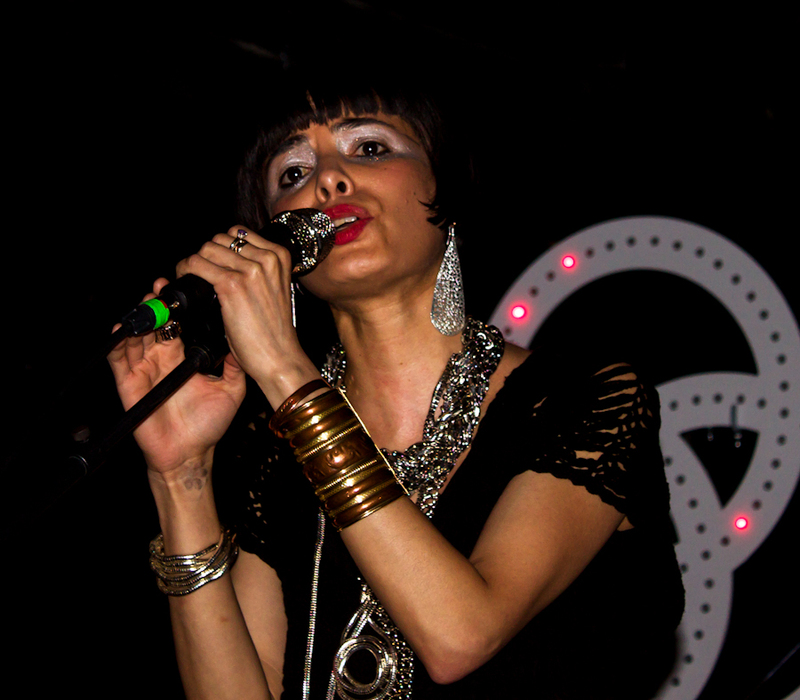 On standout tracks like “The Night” and “White Wind”, Alejandra’s voice held the enthusiastic audience in her thrall (despite the distraction of the group’s somewhat budget light show). Indeed, when she launched into Ghostory’s best track, the thematic touchstone “Lafaye,” we all might as well have been hypnotized, swaying along to the ethereal tale of a girl and her ghosts. SVIIB’s newfound confidence in its sound translated well to their older material as well, raising the level of craft of these earlier tracks, and offering hope that Ghostory could be a harbinger of even bigger things to come. Newer PostTHIS JUST IN: Axl still doesn't quite "get it"